Embrace the power of the black bear. This carved bear sits a top an exquisite piece of Bumble Bee Jasper, bold but not overpowering. 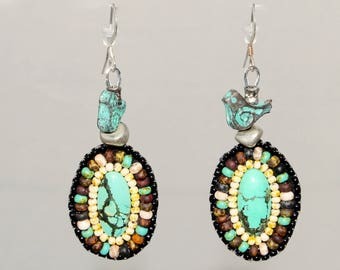 Surrounded by soft neutral Picasso finish Japanese seed beads and Etched Czech glass beads. The pendent hangs on 3mm leather cord measuring 20 inches in length with additional 2 inch adjustable links. The pendant is approx. 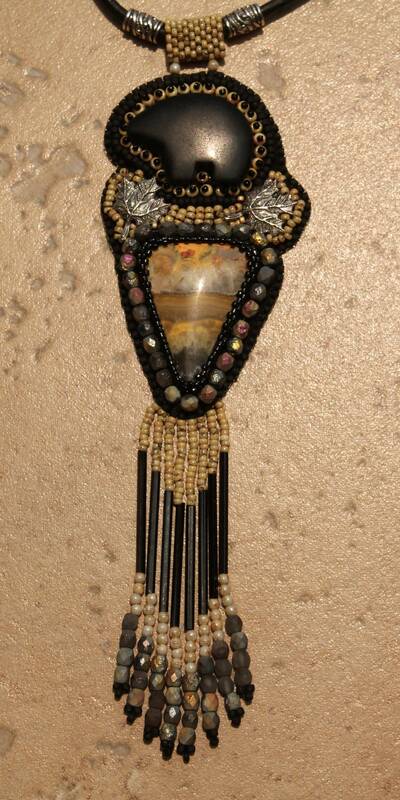 7 inches long including the gorgeous fringe that has vintage 30mm black bugle beads. Backed in black Ultra Suede.